On March 6th, 2013, The Orianne Society launched its very first online edition of Indigo, our Member Magazine, marking another addition to our Member Services. 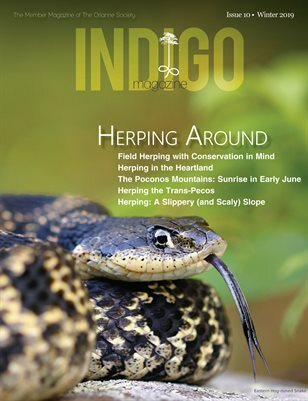 The magazine, with this issue focusing primarily on southeastern U.S. snakes and habitats, brings readers closer than ever before to these fascinating species and those who seek to conserve them. For fans of the magnificent Eastern Diamondback Rattlesnake, there is “Our Giant Serpent of the Southeast”, an in-depth look at Eastern Diamondback Rattlesnake ecology, the threats to this species, and The Orianne Society’s efforts to conserve them. Also inside this issue, Dirk Stevenson, Director of Inventory and Monitoring for The Orianne Society, reflects on 40 years of snake hunting. You’ll climb aboard a canoeing odyssey down the Suwannee River, swat a few mosquitoes and listen for telling pings on Eastern Indigo radio-telemetry adventures, learn more about becoming an Orianne Society Member, and you’ll love an inspiring collection of snake and habitat photography submitted by you, our members and followers. Indigo Magazine is just one of the many benefits of joining The Orianne Society, so reserve your issue today by becoming a supporting member at http://www.oriannesociety.org/become-member.